How the NFL polices its players is a perennial subject of conversation and debate, but perhaps never before has it so dominated the talk heading into a new season. The central story, of course, was that of Baltimore running back Ray Rice, who in February was arrested and charged with assaulting his fiancée—an incident whose aftermath, Rice dragging her seemingly unconscious body out of an elevator, was caught on video and made the rounds online—and whose resulting two-game suspension was widely criticized as unequal to the crime. Rice will miss the first two games of the season that starts this week, costing him $470,588 in salary. And while this is much more than the $12,000 that Cleveland quarterback Johnny Manziel was docked for raising the wrong finger during a televised game, it is far less than the $1.4 million Manziel’s teammate Josh Gordon will lose after the NFL upheld its one-year suspension of the wide receiver following a second marijuana-related violation. One commentator, when discussing Rice’s suspension, asked aloud whether the NFL had been “lenient enough.” This got us at NerdWallet wondering about how the discipline the NFL hands down compares with that of other pro sports leagues. We looked at 10 years of data to find out. 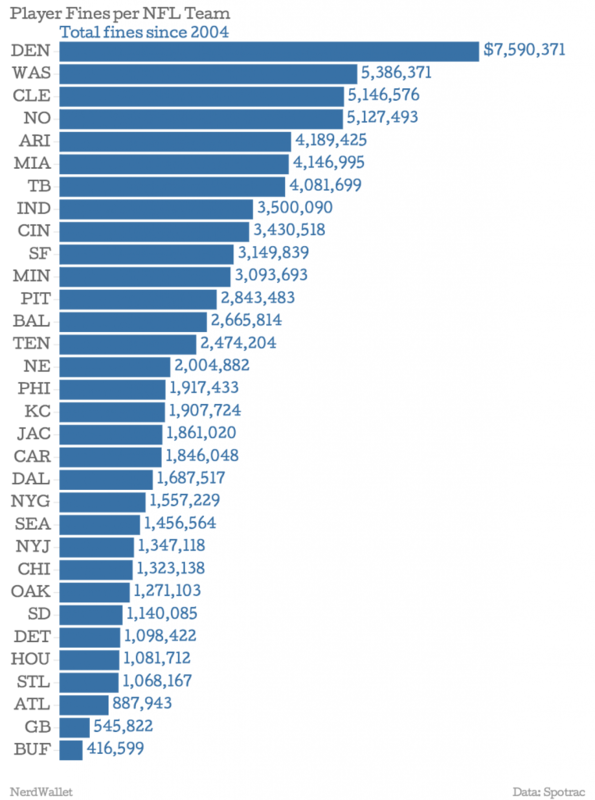 First, we looked at how total and average player fines in the NFL have compared to the NBA and MLB since 2010. The NFL has fined its players a total of $66.9 million since 2010, more than MLB and the NBA have penalized their players. But there are more players on rosters in the NFL (about 1,700, compared with 1,200 in MLB and 450 in the NBA), so from another perspective, football’s average fine per player is lower than that in baseball or basketball. Arizona linebacker Daryl Washington is the most-fined NFL player of the last decade, thanks to a couple of substance-abuse violations, including one that will see him miss the entire upcoming season. 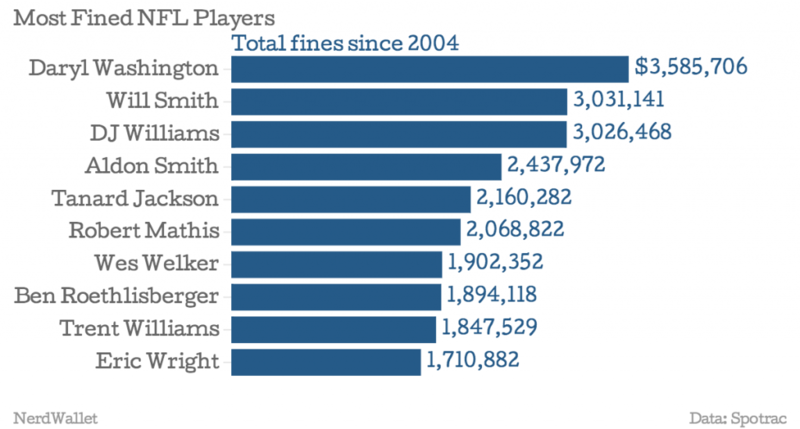 In fact, 72% of these ten players’ fines are because of substance-abuse violations or using performance-enhancing drugs. 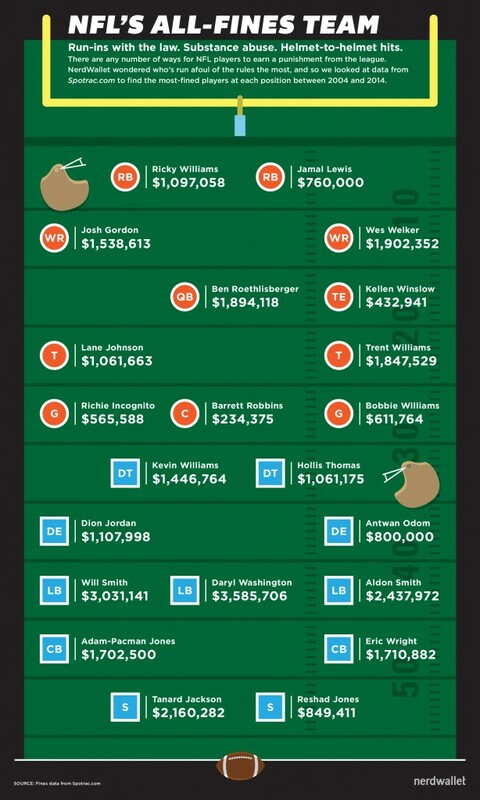 When looking at the $81.2 million in fines the NFL has levied since 2004, we see that $42.9 million was for substance abuse and/or PED infractions. Meanwhile, just $8 million was for off-field violence or legal issues (domestic violence, DUIs, assault, arrests and other misdemeanors and felonies). Based on data from the last 10 years, the average drug-related violation costs a player 4.6 games and $282,101, while the average punishment for off-field violence, arrests or other legal trouble is a 3.1-game suspension and $266,948 fine. Last week, NFL commissioner Roger Goodell announced the league is strengthening its policy on domestic violence: From now on, any player who commits assault, battery or sexual assault will be suspended six games for a first offense, and at least one year for a second offense. This brings the NFL’s punishments for domestic violence more in line with those for drug-related violations. Both teams feature some notable names, but the defensive team wins (loses?) this game, with fines totaling $19.9 million compared to the offense’s $11.9 million. NFL logo image via rmtip21/Flickr. Infographic by Brian Yee.